When guitarist Danielle O'Hallisey, 57, was growing up outside Pittsburgh, the sky was yellow with steel-mill air pollution. On her move to Vermont in 1984, she discovered similarly colored skies caused simply by sunsets. O'Hallisey alludes to that strange concurrence of dystopia and utopia in the name she has given her Worcester-based trio, Yellow Sky. 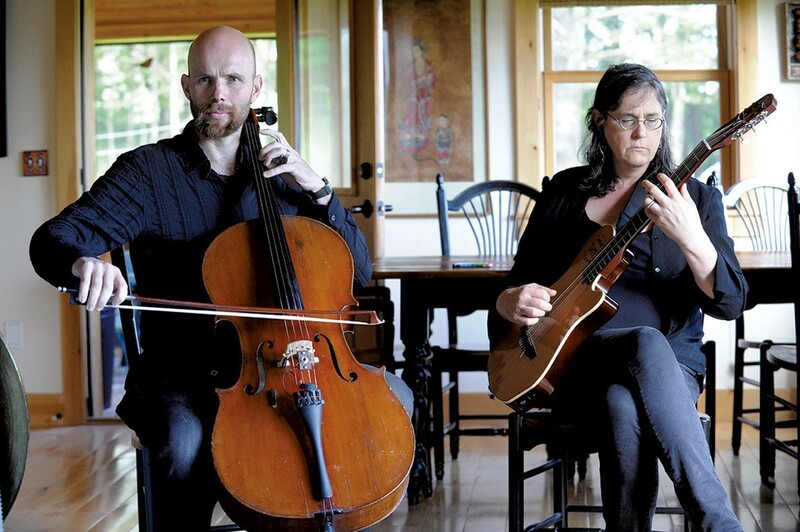 As the newest arrival on Vermont's classical scene, the trio explores an unusual concurrence of sound, too: O'Hallisey's seven-string Godin guitar paired with synthesizers — she calls her instrument "electronic guitar" — plus violin and cello. For this combo, O'Hallisey composed a suite of 11 short pieces called String Ka-tet in D minor. Inspired by The Dark Tower sci-fi/fantasy novels by Stephen King, a favorite of O'Hallisey's, the work premieres at Yellow Sky's inaugural concert in Montpelier Saturday, June 18, with Letitia Quante on violin and Michael Close on cello. A CD of String Ka-tet will be available at the concert. O'Hallisey recorded the work with Close and Liz Reid, who substituted on violin while Quante was on maternity leave. Reid, who is primarily a violist, will join the group after the first concert, making Yellow Sky a quartet. The music is worth checking out beforehand; three tracks are posted on YouTube. O'Hallisey calls the music "neoclassical" — in the sense of "new classical," rather than the contested term that refers to certain music written between World Wars I and II. But she prefers not to characterize it beyond that. "I don't want people to have a presupposition of what this will sound like," she says. Quante, of Fairfax, describes String Ka-tet as "slightly minimalistic. Everything is in eight- or 16-measure jazz riff form, and she gets these tunes that really soar." Some movements have a driving beat; others feature sustained sounds. Most movements last three minutes, some less than one. The overall mood is "mysterious and dark," says Close. O'Hallisey has been composing since her early teens. Though she didn't complete a degree, she studied film composing at Berklee College of Music and pursued other musical interests at the New England Conservatory and Hartt School. In Vermont, O'Hallisey taught guitar at Johnson State College for four years before becoming an engineer; she now owns her own company. The composer is also an inventor, according to Close. "She's really into the technology side of music," he says. "She loves playing with effects." In a blog post, O'Hallisey mentions the "mad numbers of plug-ins and custom hacks" in her electronic music set-up. O'Hallisey is inspired by "classical musicians well versed in electronic music" and other crossover groups: pop bands with a cellist, jazz groups that include a string quartet. She cites Icelandic composers Ólafur Arnalds — whose The Chopin Project uses electronic looping effects — and Jóhann Jóhannsson, who wrote the soundtrack for the film The Theory of Everything, as particular inspirations. After taking a 10-year hiatus from guitar, O'Hallisey was reinspired by a new teacher: Larry Coryell, a Florida-based fusion jazz musician who trained in classical guitar. She studies with him twice a month via Skype. O'Hallisey was working on String Ka-tet when she won a Vermont Arts Council creation grant to fund its completion. The guitarist applauds the "amazing" musicians who help to bring her composition to life. All three have spent much of their professional lives in the classical arena: Quante is Juilliard-trained and studied with the Emerson String Quartet; she and Reid both play with the Vermont Symphony Orchestra as subs and with the Burlington Chamber Orchestra. Close plays with the Montpelier Chamber Orchestra Society. Each also participates in the alt-classical scene, including the Vermont Contemporary Music Ensemble (for which Close has composed), TURNmusic and Music-COMP, the online mentoring program for young composers, which presents annual performances. Quante has even played a Kanye West tour. "When people have interesting projects, I usually join in," says the violinist, also a fan of The Dark Tower. Never mind their interest in sci fi; the musicians' meeting may have been fated. O'Hallisey borrowed the name "Ka-tet" from King (after gaining permission); it means "a group of people put together by fate to accomplish something," says the composer. Yellow Sky's very existence is an accomplishment, and it promises to enrich the state's classical scene in interesting ways. The original print version of this article was headlined "Neoclassical Group Yellow Sky Debuts With Sci-Fi-Inspired Suite"